Recently, my nine-year-old grandson had his mother send me a list of questions about my immigrant parents and their parents. A 4th grade school assignment, San Francisco style. I was to supply data about the how and when—if not the crucial why—of their removal from Europe. And a stream of isolated memories, a few anecdotes and short scenes recalled from 65 and more years ago began to present to my mind's eye. I threw off simple dates and places to him, as well as my reply to that "sociological" chestnut, What cultural traditions did they bring with them? Which was, "They brought the clothes on their backs." Perhaps few have much more, even if names and dates can be located in Ellis Island files. Who they were is not what is left for a child to imagine, even children descended from Daughters of the American Revolution or Southern gentility, such as it was. I have a friend, one of whose forebears was that Giovanni Cabotto who discovered Newfoundland, later known as America. Still, apart from his pedigree, loftier than the Lodges, those most snobbish of Boston Brahmins, can boast, there is little he has ever cared to summon up to decorate the hours of his life. In other words, our past, be we who and whatever we may, is but shades of shadows. As Hamlet remarks on the visiting actor's melodramatic recital of a lamentation from some historical drama, What's Hecuba to him, or he to Hecuba,/ That he should weep for her? The first thing I thought of as an aide-memoir was no crumbled, evanescent recollection of a tea biscuit like Proust's madeleine, but a cigarette lighter I found in a bureau drawer beneath the nylon hose left behind after my mother's sudden death a month short of her 80th birthday as she sat dressed for work, awaiting the taxi's horn in the street outside. I had seen it long ago in childhood when I rummaged—as kids do—through her things one rainy afternoon in the latter 1930s. It had been left behind as a souvenir on her own mother's return from a voyage to France in 1938. Hoping to claim a legacy of say 450,000 francs (c. $30,000), Golda Bronsweig had come up from Philadelphia to stay a week in our apartment before sailing out. Of that visit I remember only a bitter quarrel between her and my mother. About what? My grandmother had sent out the laundry—my mother worked for the city's welfare department those years—and had it returned as wet-wash, which she spent a day drying and ironing, sheets and pillow cases, underwear and all, much to my mother's dismay and anger. Thrift, thrift! cried Golda. Pinching a penny was that legacy indurate from her life in Paris where my mother had been born in the Marais, the Jewish Quarter that bordered the then derelict palaces of the 16th Century. Today ultra-fashionable, with Les Halles along the Seine, although its Rue de Rosiers running parallel a few blocks from the Seine remained more or less what it was a century ago when I saw it in the 1970s: tradesmen, tailors, cobblers, grocers. What was that legacy? My grandfather Joseph had served as a cavalry officer in the Russian army, one of more than 400,000 Jewish lads conscripted in that epoch for 20-year terms. He had been decorated for his outstanding service during the Russo-Japanese war that Teddy Roosevelt had helped settle after 1905. Demobilized following the peace accord, he returned to his native Odessa and married his fiancée. During 1906 and later, the Czar more or less wittingly unleashed those infamous "Black Hundreds" who terrorized and destroyed Jewish villages and slaughtered Jews in a series of pogroms in Ukraine and southern Russia. A proud man, he was not going to put up with that, and began a move west, his first daughter Fanny to be born in Bucharest. There were parents in Paris, whether his or Golda's I never learned, though I have two little fotomat pictures of them from Les Halles sent to her in the early 1930s. And at this point we have the origin of the cigarette lighter souvenir. Joseph reached Paris in 1907, the year my mother was born there in the Rue de Rosiers. He was probably a bespoke tailor, since it seems he won a gold medal in 1911 for "Men's Smoking," as it was termed in Europe, a prize-winning tuxedo he'd designed. Three years later the Kaiser Wilhelm's army tore into the French border, and there came a peremptory knocking at the door of their flat. Opening, he saw two French officers saluting him. —Monsieur Bronsweig, you have heard Germany is at war with France once more? —So I have. Your question? —We know you were a distinguished cavalry officer in the army of our ally, Czar Nicholas. —Brave, experienced soldiers such as you are vital to our nation's cause, Monsieur Bronsweig. —Écoutez, mes trés-trés chers messieurs. Three times since 1907 have I submitted an application for my first papers to enlist myself a French citizen. Three times were they denied me. It is now 1914—and you knock at my door and dare ask me to serve in your war? —You are needed at the front, Capitaine. We have come to present you with your commission! You should consider how generous our offer is! Joseph's prompt reply must have been devastating. It was snarled, Je m'en fiche de vous et de tous vos salauds de Français! as he gave them the fig (today's middle finger), "Up yours! —In that case, Monsieur Bronsweig, you have 24 hours to quit our sacred French soil! The door is slammed shut. Packing promptly starts. Joseph is on a train to Bruxelles by midnight, thence to ship for Philadelphia, where it seems an older brother had settled earlier. Within two years Golda, now mother of four girls—Fanny, my mother Rochelle, Sarah, and Bertha born in Paris—decides to run the submarine gantlet somehow, because, as my mother recalled her muttering, girls are on the street, selling themselves for a loaf of bread in the Marais... and never mind Zeppelins dropping bombs over Paris at midnight. And she makes it to Ellis Island, enraged by a photograph Joseph had mailed back of himself in a fine suit and sporting an elegant gold watch chain across his waist. During the next ten or more years, there was correspondence, as those two fotomat portraits evidence. Golda's mother was illiterate and was accustomed to hire a student to whom she would dictate her letters to Philadelphia. That woman had saved bundles of francs from the time of the war, fortune-telling and black-marketing proceeds and the like; but as was common then, never entrusted them to some cashier behind a local bank's wicket. They seem to have been tightly bound and suspended from a cord around her hips under her voluminous skirts. She would dictate a letter; go to a corner of the room and, bending over, fish out a note to pay that scribe. He was not blind, of course, and at some point in the early 1930s simply shot her where she stood. And that same moment in walked her husband, my great-grandfather, who was promptly murdered, too. For a week or two the newspapers featured the hunt for the killer, with flamboyant headlines (my mother recalled) like: Crime and Punishment in the Rue de Rosiers, etc. That hapless student was caught, tried, and sentenced for life on Devil's Island, Papillon's prison. But—what had happened to the fortune he killed two old folks for? The police had seized and sequestered it. In the course of things, Golda had learned about it and ventured to claim her mother's cash. She sailed from New York, vanished in Paris for a few months, only to return empty-handed. It seems Golda couldn't prove to the satisfaction of the French court her identity, because they demanded documents—documents!—verifying her own grandmother's maiden name... in Odessa yet, after the 1917 Revolution? From the years before 1848! Jews in the Russian ghetto of Odessa, a wild place indeed, all gangsters like the infamous or notorious Benya Krik, to have birth certificates? Never mind Jews, let alone women! Golda returned empty-handed and disconsolate to New York on her way to Philadelphia. 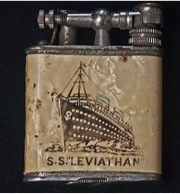 But she had brought something for my mother, a smoker then, the fancy cigarette lighter she purchased from the purser's shop on the S.S. Leviathan. Was that any kind of tale for a child of nine to read out to some innocent American teacher and classmates a century after its nastiness?